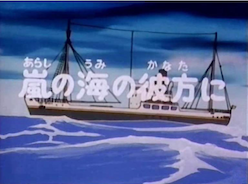 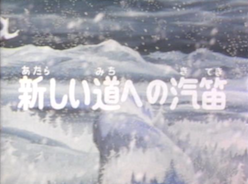 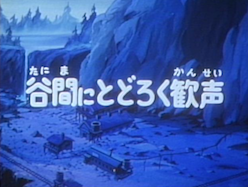 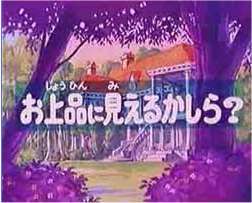 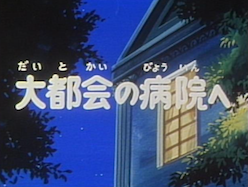 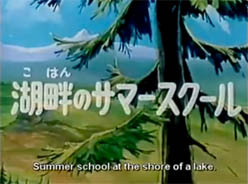 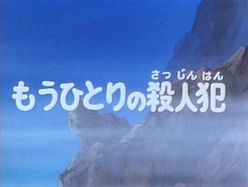 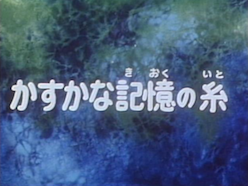 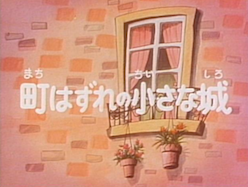 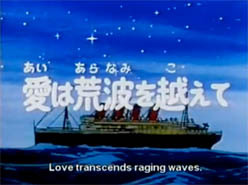 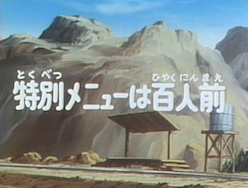 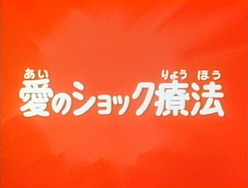 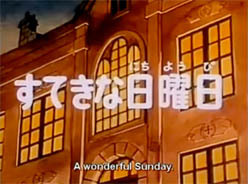 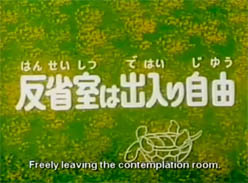 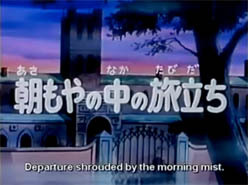 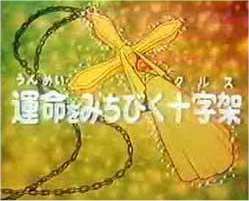 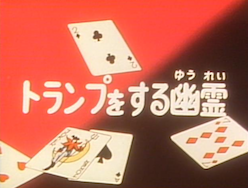 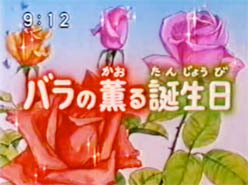 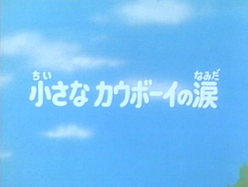 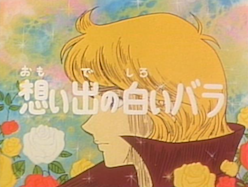 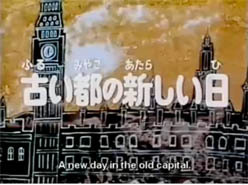 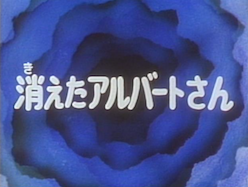 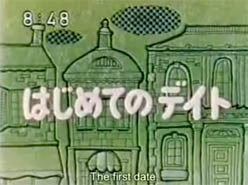 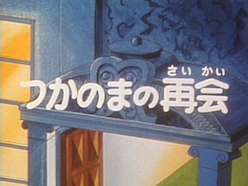 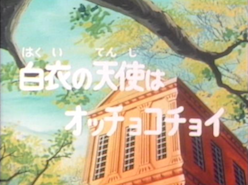 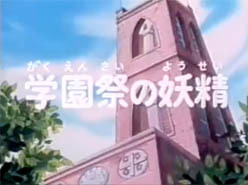 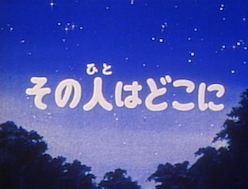 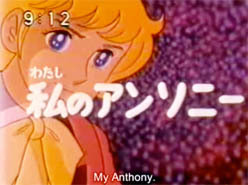 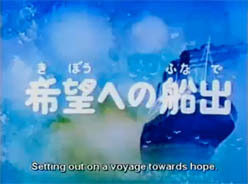 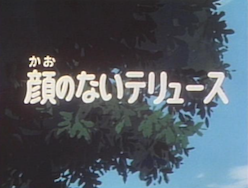 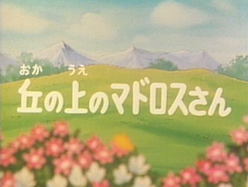 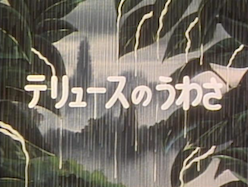 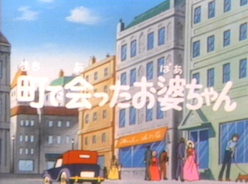 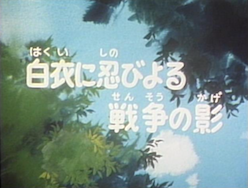 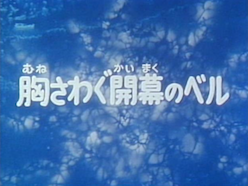 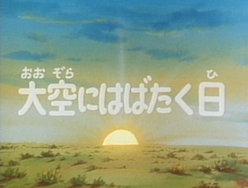 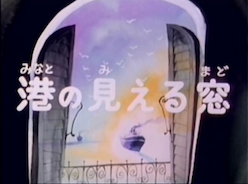 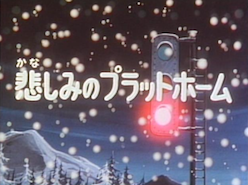 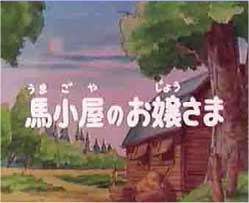 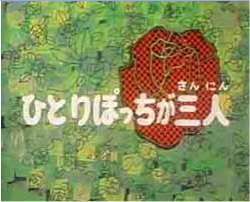 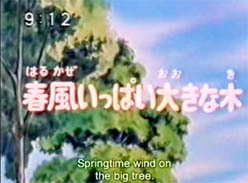 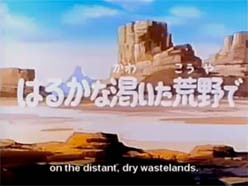 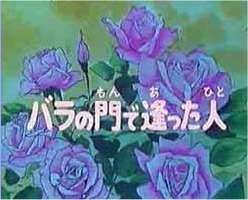 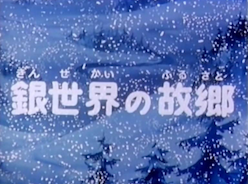 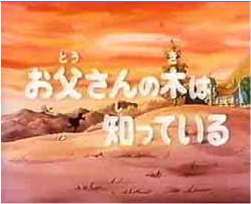 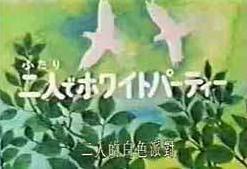 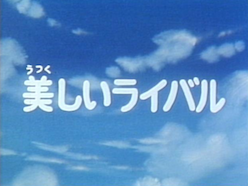 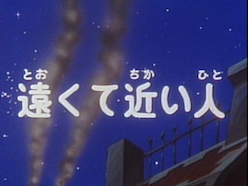 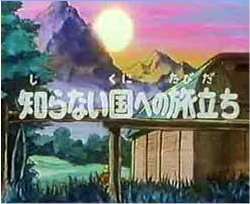 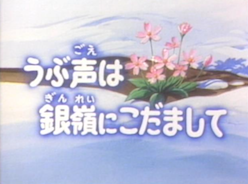 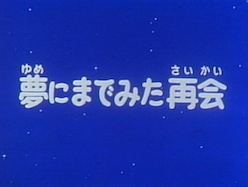 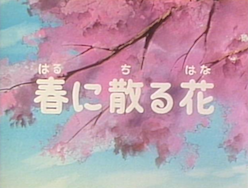 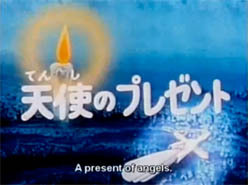 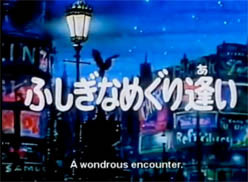 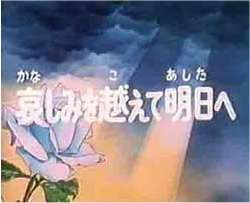 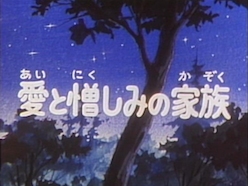 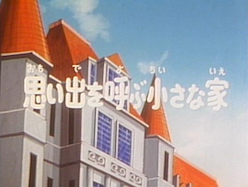 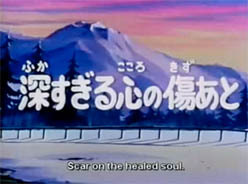 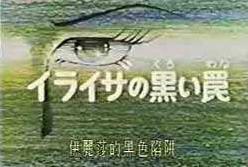 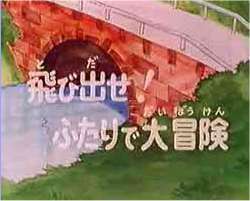 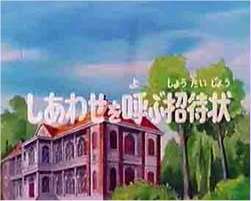 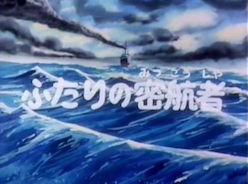 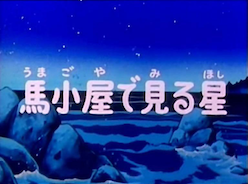 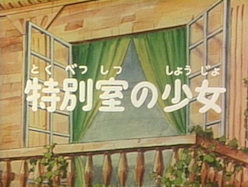 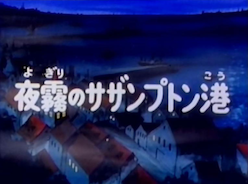 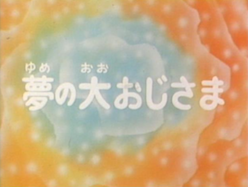 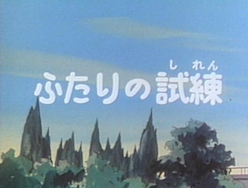 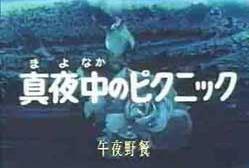 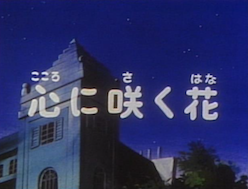 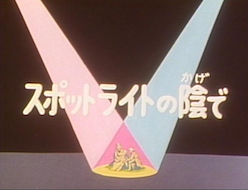 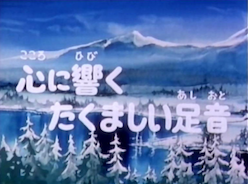 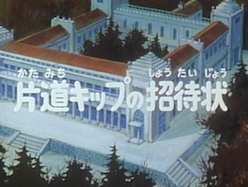 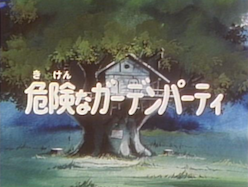 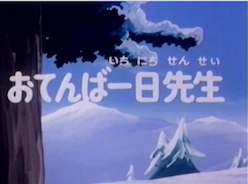 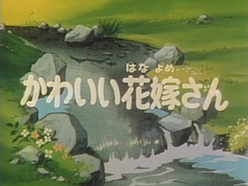 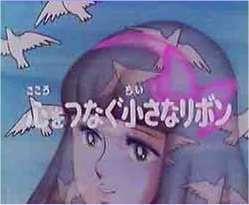 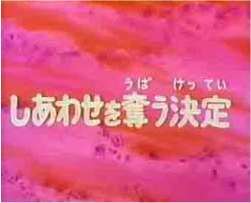 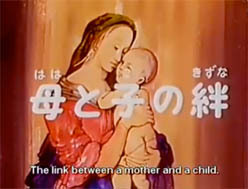 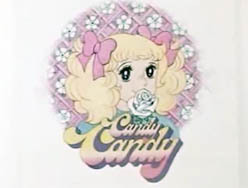 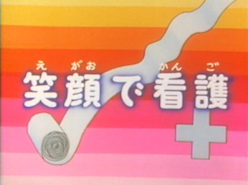 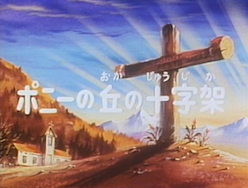 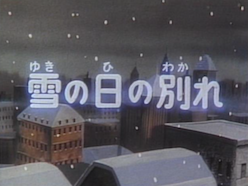 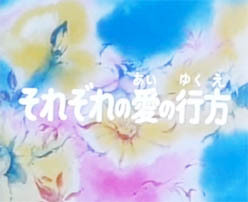 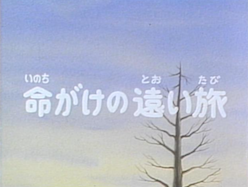 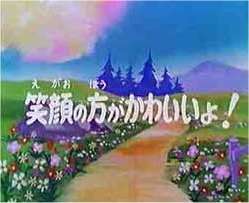 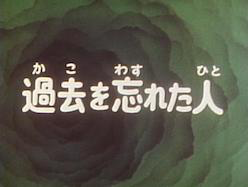 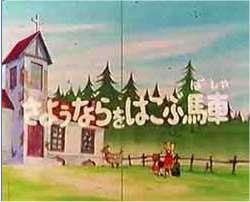 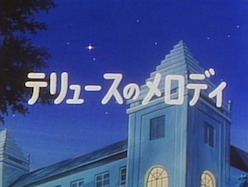 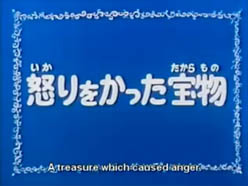 However, in the original version, each episode used to open with a pretty picture that changed at each episode. 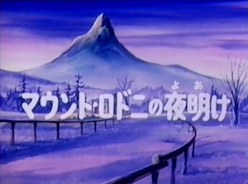 Episode 1 - "A Pretty Lasso-Wielding Girl"
Episode 2 – "Take off! 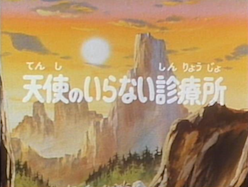 Adventuring Together!" 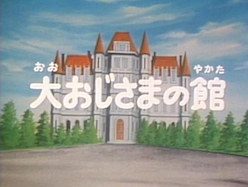 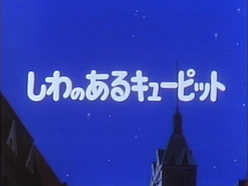 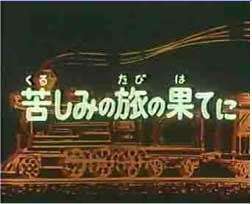 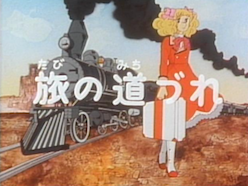 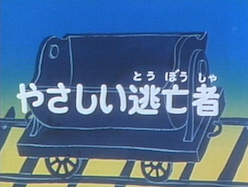 Episode 3 - "A Good-Bye from the Carriage"
Episode 4 - "You're cute when you smile!" 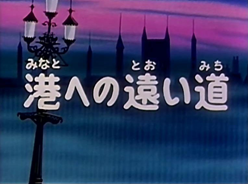 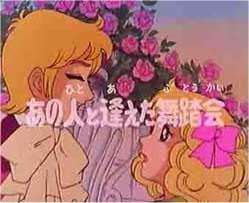 Episode 5 - "From today, I'll be a princess?" 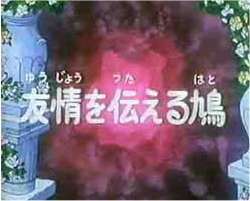 Episode 6 - "The person I met at the rose gates"
Episode 7 - "Am I elegant?" 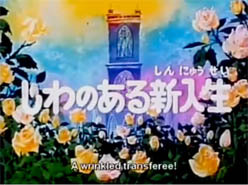 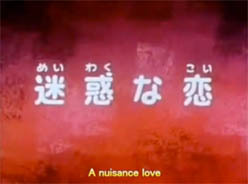 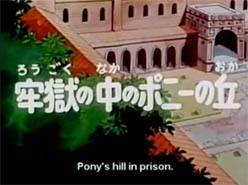 Episode 8 - "Invitation of happiness"
Episode 9 - "The dance where I met Him"
Episode 11 - "A small ribbon connecting hearts"
Episode 12 - "A rose-scented birthday"
Episode 13 - "The lonesome three"
Episode 14 - "Springtime Wind on the Big Tree"
Episode 15 - "The decision which took away my happiness"
Episode 16 - "Departure to an unknown country"
Episode 17 - "On the distant, dry wastelands"
Episode 18 - "Fate-guiding cross"
Episode 19 - "At the end of the difficult journey"
Episode 20 - "Happy like in a dream"
Episode 23 - "The first date"
Episode 24 - "My Anthony"
Episode 25 - "Transcending the sadness for the sake of tomorrow"
Episode 26 - "Father-tree knows"
Episode 27 - "A present of angels"
Episode 28 - "Scar on the healed soul"
Episode 29 - "Setting out on a voyage towards hope"
Episode 31 - "A new day in the old capital"
Episode 32 - "Another Pony Hill"
Episode 33 - "A wrinkled transferee!" 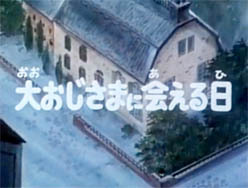 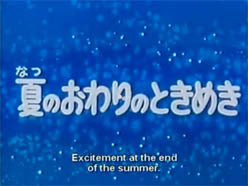 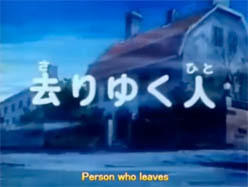 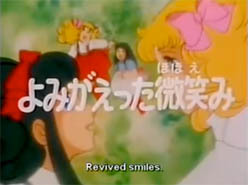 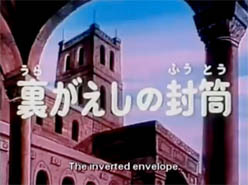 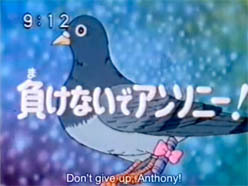 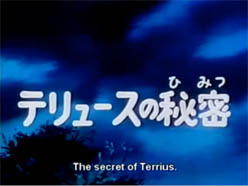 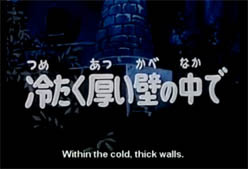 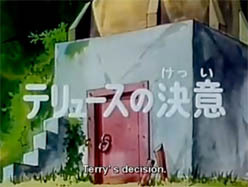 Episode 34 - "The inverted envelope"
Episode 35 - "A wonderful Sunday"
Episode 36 - "Revived smiles"
Episode 37 - "A wondrous encounter"
Episode 38 - "Terry's secret"
Episode 39 - "A treasure causing anger"
Episode 40 - "Freely leaving the contemplation room"
Episode 42 - "A midnight picnic"
Episode 43 - "Summer school at the shore of a lake"
Episode 44 - "The link between a mother and a child"
Episode 45 - "White party for two"
Episode 46 - "Excitement at the end of the summer"
Episode 47 - "Eliza's trap"
Episode 48 - "Within the cold, thick walls"
Episode 49 - "Terry's decision"
Episode 50 - "Departure shrouded by the morning mist"
Episode 51 - "The long way to the port"
Episode 52 - "The star I saw from the barn"
Episode 54 - "Night fog at the Southampton port"
Episode 55 - "Two stowaways"
Episode 56 - "On the other shore of the stormy sea"
Episode 57 - "The port through the window"
Episode 58 - "Silvery homeland"
Episode 59 - "One day as a naughty teacher"
Episode 60 - "Determined footsteps that resound in one's heart"
Episode 61 - "Decision time"
Episode 62 - "Steam whistle towards new frontiers"
Episode 63 - "The granny in the street"
Episode 64 - "The angel in white is a dim-wit"
Episode 65 - "The smiling nurse"
Episode 66 - "Grandfather from dreams"
Episode 67 - "Where is she?" 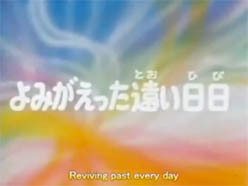 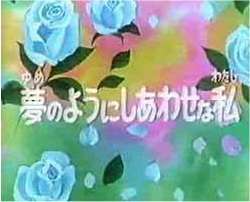 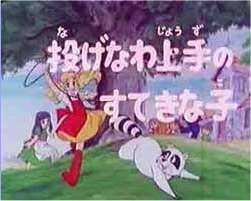 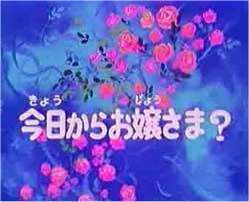 Episode 68 - "Scattering blossom petals"
Episode 69 - "White rose of memories"
Episode 70 - "A cute bride"
Episode 71 - "Mr. 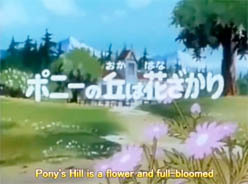 Sailor on the hill"
Episode 72 - "The young lady at the Special-Care ward"
Episode 73 - "Rumors about Terrius"
Episode 74 - "Heading to the hospital in a big city"
Episode 75 - "Grandfather's mansion"
Episode 76 - "The cabin of old memories"
Episode 77 - "A dangerous garden party"
Episode 78 - "Terry's melody"
Episode 79 - "The shadow under the spotlight"
Episode 81 - "Faceless Terrius"
Episode 82 - "Flowers from the heart"
Episode 83 - "The ghost who played cards"
Episode 84 - "Angels under the shadow of war"
Episode 85 - "The family that bore love and hatred"
Episode 86 - "The man who forgot his past"
Episode 87 - "Two people's trial"
Episode 88 - "The day we fly towards the sky"
Episode 89 - "The vanished Mr. Albert"
Episode 90 - "A small castle in the outskirts"
Episode 91 - "Far from reach but near at hand"
Episode 92 - "A love-shock therapy"
Episode 93 - "A Cupid with wrinkles"
Episode 94 - "A fellow traveler"
Episode 95 - "A beautiful rival"
Episode 96 - "An invitation with a one-way ticket"
Episode 99 - "Separation on a snowy day"
Episode 100 - "The platform of sorrow"
Episode 101 - "A thread of subtle recollections"
Episode 102 - "The cross on Pony Hill"
Episode 103 - "A long and life-risking journey"
Episode 104 - "A clinic that doesn't need angels"
Episode 105 - "A kind fugitive"
Episode 106 - "Yet another murderer"
Episode 107 - "A special menu for one hundred people"
Episode 108 - "Sounds of joy roar in the valley"
Episode 109 - "The tears of the little cowboy"
Episode 110 - "The troublesome love"
Episode 111 - "The memories come back"
Episode 112 - "Their own love"
Episode 113 - "A man leaves"
Episode 114 - "The day to meet the Uncle"
Episode 115 - "The flowers bloom on Pony Hill"